When your PC Running Then you want to speed up your System. I Suggest One Computer Trick . First You Install windows 7/8 in your Computer because its support all software and easy to use.If you don’t want to change your computer Operating System. By this Computer trick you can speed up your System. experience. This trick work on all OS, I tried this trick on every type of PC's & Then after we share PC trick. 2. Now search for "All Programs"
3. Again search for "Accessories". 4. Here You Can find the" Command Promote"
5. Now Right click on Command Promote As"Run As Administrator"
6. One Pop Up window showing and Click ON "Yes Button"
8. "fsutil.exe behavior set memoryusage 2"
9. Command Prompt show to you Reboot your pc for changes. 10. Now reboot your PC and All changes apply as you wish. Finally You rebooting your memory usage and increase by "one" and you can see this by type this command in CMD :"fsutil.exe behavior query memoryusage"
"fsutil.exe behavior set memoryusage 1"
Now all is done and you can see your System running faster. Please try this small trick in your own rick. Our blog and me not responsible for any problem. But we fix my System problem from this small trick very well. Now my PC speedup, we can run lots of new Software's like Games,Browsing, etc as much as smoothly. 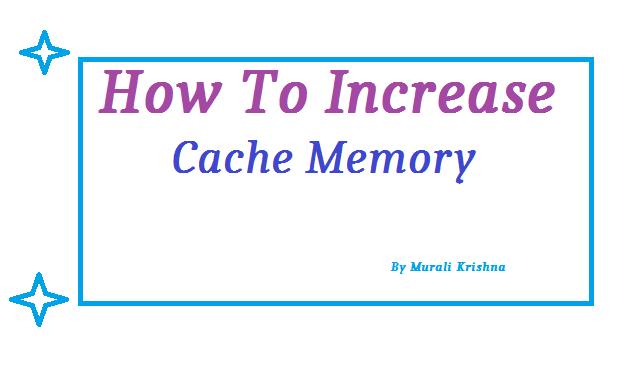 Finally ,This is nice and good tip to "How can you increase cache memory to speed up your System". I hope this Article is helpful for you. If you like This article please share With your friends on Facebook and Google Plus .This Article may help to your friends. tricks and tips.If you have any quarry related this article comment below and We resolve it very soon.